James Lang (born October 17, 1983) is an American former professional basketball player who played in the NBA for the Washington Wizards. He was selected with the 19th pick of the 2nd round (48th overall) of the 2003 NBA Draft by the New Orleans Hornets, but was waived in December of that year after back injuries kept him sidelined and after GM Bob Bass proclaimed that Lang did not show "the potential to be put on the active roster". Lang attended pre-season camp with the Utah Jazz in 2005 but did not make the team. The Toronto Raptors signed Lang to a 10-day contract on March 27, 2006 and he was waived after this contract. 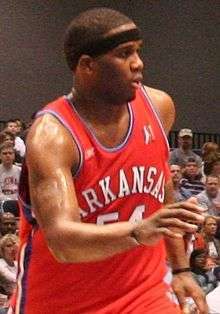 Lang had averaged 8.3 points and 5.0 rebounds in 32 games for the Arkansas RimRockers of the NBA Developmental League during the 2006 season. He signed two 10-day contracts with the Atlanta Hawks early in the 2006 season but did not see any game action. He was in training camp with the Utah Flash of NBA Developmental League gearing up for the 2009-2010 season but the 26-year-old was "waived for medical reasons" on November 18, 2009. The day after Thanksgiving in 2009, Lang suffered a stroke that left him partially paralyzed. ↑ Bob Cohn. "Ex-Wizard Lang recovering after stroke". The Washington Times. December 11, 2009. Retrieved on August 19, 2012.